Nicole Primack Andres is the leader of Primack &Associates, a Private Banking and Investment Group team within Merrill Lynch. Nicole directs the design and implementation of customized wealth strategies and tactics for a select group of ultra-high-net-worth families. She unites multiple disciplines, streamlining complex situations while pursuing each client’s objectives through bespoke investment management, trust and estate planning services, business and professional services, philanthropic services, and access to structured lending through Bank of America, N.A. Nicole prioritizes clarity, transparency, and accessibility, seeking to optimize each client’s experience through her strong service ethic and ingrained dedication to client well-being. As the architect of client portfolios, Nicole integrates each family’s unique goals, risk tolerance, time horizon, and income needs, leveraging the extensive capabilities of the firm and the acumen of its specialists. A firm proponent of client education, Nicole enjoys helping families make informed decisions about the intersection of their personal, professional, and philanthropic priorities. Nicole has garnered a number of national honors as a Financial Advisor. Barron’s magazine has distinguished her one of the Top 100 Women Financial Advisors from 2007 – 2015. A frequent media contributor, she has appeared on CNBC’s Squawk on the Street and regularly speaks at industry conferences and functions. Prior to joining Merrill Lynch, Nicole was a Director with Credit Suisse Private Bank, where she spent fifteen years advising high-net-worth individuals, family offices, international clients, corporate executives, and entrepreneurs. Previously, Nicole worked for nine years in the Private Client Services division of Donaldson Lufkin &Jenrette (DLJ) prior to its acquisition by Credit Suisse in 2000. Nicole began her financial services career in 1990 at First Manhattan Company in its Research Division. She earned her B.A. with Honors from Vassar College and has completed graduate coursework at Fordham University’s Gabelli School of Business. Nicole resides in Chatham, New Jersey, with her husband and their two children, Matthew and Avery. She stays active in alumnae activities through her affiliation with the Jersey Hills Vassar Club and ongoing support of the College. She and her husband have established academic scholarships for students at Flagler College in St. Augustine, Florida. In her free time, Nicole enjoys almost all forms of exercise including running, biking, and boot-camp classes. She also likes to explore new travel destinations with her family and friends. Nicole’s twin sister, Lisa Primack, joined Merrill Lynch in 1996 and is currently Senior Resident Director based in Wilmington, Delaware. *Source: Barron’s “America's Top 100 Women Financial Advisors” list, June 8, 2015. 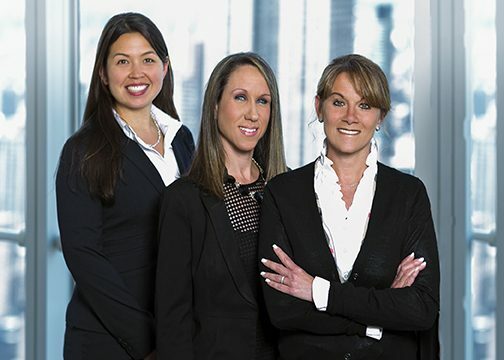 Advisors considered for the ”America's Top 100 Women Financial Advisors list” ranking have a minimum of seven years financial services experience and have been employed at their current firm for at least one year. Quantitative and qualitative measures used to determine the Advisor rankings include: client assets, return on assets, client satisfaction/retention, compliance records, and community involvement, among others. Barron’s does not receive compensation from Advisors, participating firms and their affiliates, or the media in exchange for rankings. Barron’s is a trademark of Dow Jones &Company, Inc. All rights reserved. The ranking or ratings shown here may not be representative of all client experiences because they reflect an average or sampling of the client experiences. These rankings or ratings are not indicative of any future performance or investment outcome. Robin Ramos is a member of Primack &Associates within the Private Banking and Investment Group team at Merrill Lynch. Robin serves as an analyst, focusing on team operations. Robin is responsible for servicing high-net-worth-families, implementing trading operations, and addressing client requests. She provides attentive and responsive service, seeking to deliver a world-class client experience. She excels at responding to requests for information, anticipating and customizing services to meet client needs, and executing day-to-day tasks. Robin brings diligence and precision to her role, cementing her value to clients and team members alike. She enjoys learning new skills, amplifying the value that she can contribute to client families. Robin has worked in wealth management since 1997. She began her career at Donaldson, Lufkin &Jenrette, where she was a Relationship Associate. Her career also includes tenures with LRL Capital, a hedge fund firm, where she was an Operations Analyst, and Credit Suisse Securities, LLC, where she served as a Relationship Associate and Assistant Vice President. In 2015, Robin moved with the team to Merrill Lynch. She earned her B.S. in Business Management from St. John’s University. Robin lives in Long Island, New York, with her husband Rich and their two children. In her free time, she enjoys staying fit and spending time with her family. Kimberly Ward is member of Primack &Associates within the Private Banking and Investment Group at Merrill Lynch. As an Assistant Vice President and Private Wealth Analyst Relationship Management on the team, Kimberly applies her organizational skills to assist clients in pursuing their long-term objectives with forethought, precision, and care. She brings insight and experience in helping clients leverage the extensive range of resources at their disposal. As a key point of client contact, Kimberly prides herself on solving problems and anticipating needs. Her extensive experience working with ultra-high-net-worth families has made her highly attuned to their distinctive circumstances and priorities. Prior to joining Merrill Lynch in 2015, Kimberly was an Assistant Vice President and Relationship Associate with the Credit Suisse Private Bank, where she worked for ten years. She holds a B.A. in Economics and Russian from Boston College. In her free time, Kimberly volunteers with The Family Center in New York City. A distance runner, she has completed multiple marathons. She also enjoys photography and travel.